A striking tropical ornamental, in warm climates you can't miss angel's trumpet, Brugmansia (nightshade family, Solanaceae). (Datura species are closely related and also go by the common name angel's trumpet but are also called jimson weed and thorn apples. They are smaller, grow in colder climates and are nonwoody plants). This is an American tropical plant now found all around the world. The flowers come in shades from yellows to pinks to white. The big flowers open in the evening and release a strong, rich scent, presumably to attract bats and moths. They do look like trumpets, making the plant easy to recognize. 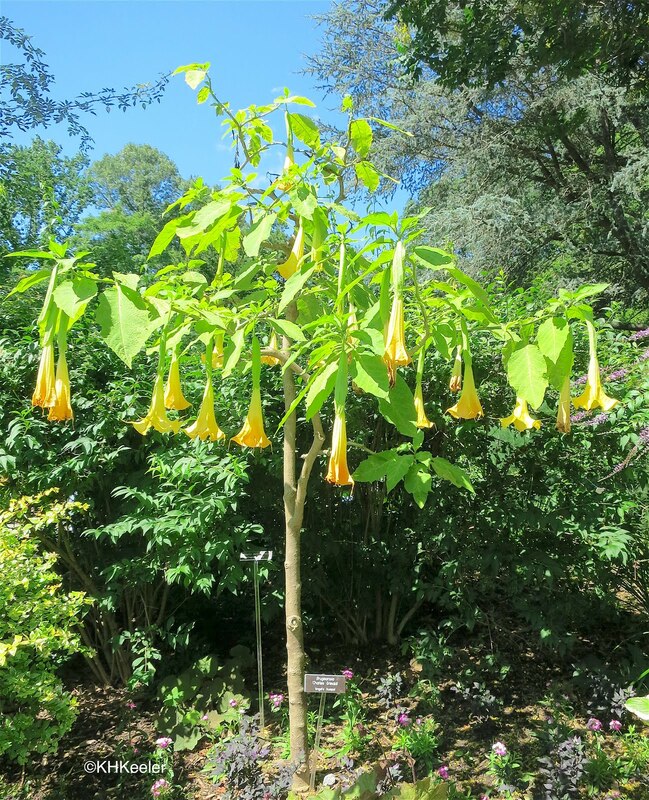 However, the "angel's trumpet" name is best interpretted as meaning, "if you consume this plant, you'll hear the angel's trumpet": this is a very poisonous plant. All parts are considered dangerous, especially seeds and leaves. Like their relatives in the genus Datura and other toxic members of the nightshade family, they are rich in tropane alkaloids, including atropine, hyoscyamine and scopalamine. The effects of ingesting angel's trumpet tissues include peculiar, distorted vision, delerium, halucinations, severe headaches, abnormally rapid heartbeat, diarhea, convulsions, smooth muscle paralysis, and death. Worldwide, each year a few people are hospitalized having ingested angel's trumpet but most recover without lasting problems. It is not that it can't kill people, it definitely can, but it reputedly doesn't taste very good and people rarely consume very much. The hallucinations that are part of its effects made it part of the folk medicine and divination of indigenous people in the Americas and since it was carried to Asia and Africa, there as well. It is considered very dangerous, not the least because the effect is so strong that people lose contact with their surroundings. 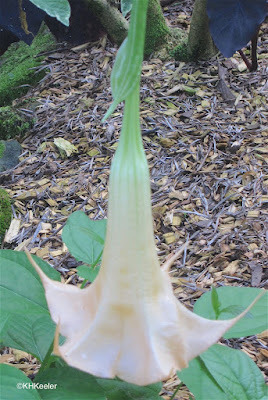 Shamans across tropical America used angel's trumpet (very carefully) in sacred rites, especially for divination. The visions seen were also used to diagnose problems, sometimes when taken by the healer for insight, sometimes taken by the patient whose behavior under the drug would suggest the cause of his or her problems. It does not seem to have been used as a recreational drug because, in addition to the danger of overdose, the hallucinations were often unpleasant. 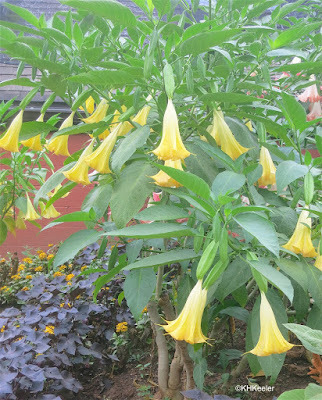 Traditional healers, the world over, have applied lotions containing a bit of angel's trumpet externally as medicine to relieve a variety of types of pain. 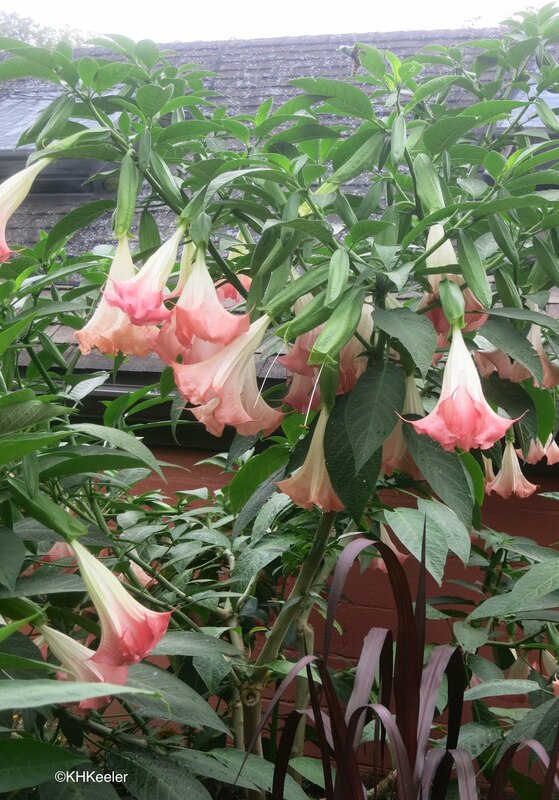 Throughout the Americas angel's trumpet's sweet scent was widely believed to induce sleep: some villages had stands of angel's trumpets through which people would walk if they couldn't sleep. The case studies indicate agitation as a symptom but also heavy sleep after convulsions, so this use seems problematic. 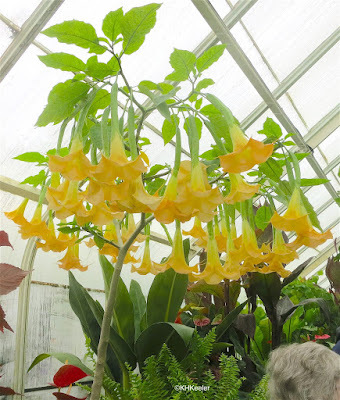 Angel's trumpets, all the seven species of Brugmansia, are listed by the International Union for the Conservation of Nature (IUCN Red List) as extinct in the wild. Indigenous people in the Americas have cultivated them for centuries and across the rest of the world they have been introduced and in some places become weeds, but wild native plants cannot be found. Biologically the plants have other mysteries. Seed set and seed dispersal is poor in cultivated plants: where it has become a weed it mostly has spread by suckering. Hay (IUCN assessment) wrote "The complete lack of evidence of fruit dispersal or spontaneous seedlings [of Brugmansia suaveolens], combined with the presence of large numbers of fruits containing viable seed, suggests their dispersers are extinct." Perhaps that is why it is extinct in nature. Angel's trumpets are spectacular plants, easy to grow and now found all over the world, whose natural history in their area of origin is virtually unknown. Because they appeal to humans, they are doing well but it is a curious story. Brugmansia suaveolens Wikipedia link Lots of good stuff in the Wikipedia article. De Feo, V. 2004. 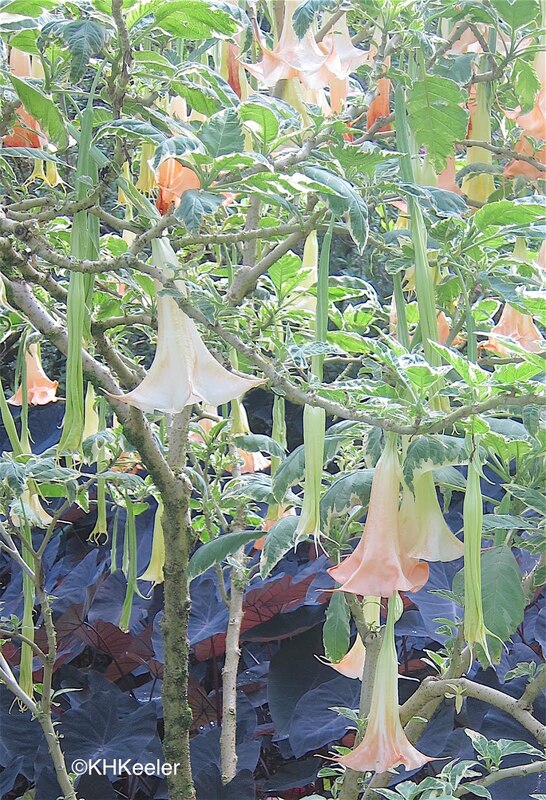 The ritual use of Brugmansia species in traditional Andean medicine in northern Peru. Economic Botany. 58 (Supplement): S221-S229. Lusweti, A., E. Wabuyele and P. Ssegawa, and J. Maurenootoo. No date given. 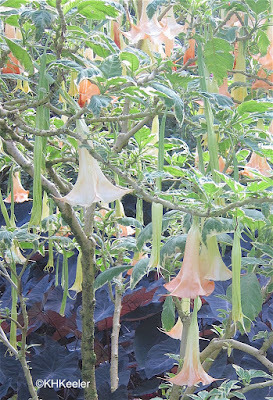 Brugmansia suaveolens (Angel's Trumpet). BioNet-East Africa link Accessed 1/16/19. Good write up. I enjoyed it. I love Angel Trumpets. I was a passionate Gardner for many years, until I decided it was time to downsize...now I'm a frustrated gardener. Are you on Facebook?